Murtaja Baseer, the constantly cheerful, professor of Fine Arts, has not really had a life without its vicissitudes – as one may imagine. He was forced to oscillate between the two wings of the then West and East Pakistan – holding exhibitions at Dhaka, Lahore, Karachi and Rawalpindi. He wasn't happy being away from home. He says, “I was like a shuttle cork”. Earlier, in 1954, he learnt Art Appreciation in Kolkata from the well-known art authority OC Gangooly. His deep interest in art history and art appreciation begins from this time, which in turn, influenced his own work. As a painter, his stay in Italy also strongly shaped his philosophy and work. This was from 1956-1958. This fixed in him the study of structures. He studied in particular how to present his figures in a two-dimensional way. His education in Mosaic and graphics was in Paris from 1971-73. When he painted at first, this was a delineation of bourgeois life, with its everyday chores and happenings. Going to Italy opened the world of the use of the palette knife in the outlines of figures. He knew the dramatist Sayeed Ahmed and poet Faiz Ahmed Faiz from close quarters. Having studied at Florence and Paris, as well as Kolkata, he has an understanding of the best of fine arts work – from both the east and west. 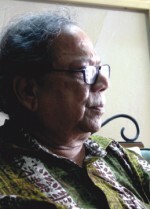 A contemporary of Aminul Islam from the Art College, Dhaka, he was a well-known and well-loved professor of fine arts at the Chittagong University. From 1971 to 1973, during the Liberation War, he escaped with his wife and two daughters one being 18 months and the other eight years. His sojourn in Paris was supported by his brother, who was a physician. With that financial backing Baseer studied in the Ecole de Beaux Art and Academy Goetza, where he mastered etching and aqua-tint in four years. During that time he felt like a nomad–which he did often and often–when studying and working away from home, in Bangladesh. He was an out and out gypsy from 1959 to 1970, as he puts it himself. While in Karachi, “to try my luck” as he puts it, he stayed with Sayeed Ahmed, who, at that time was not the well-known personality, that he later became. Sayeed was working as the Deputy Controller of Naval Accounts . Baseer stayed with Sayeed's help, in the Defence Club for some months, working on his canvases. Then he moved on to the residence of Stanly Watson, the Director of the American Friends of the Middle East. He stayed next to Zia Mohiuddin who, was at that time not as famous as was after acting in “Passage to India”. There Baseer held an exhibition of 24 canvases, some being ones he did while in Venice. This was sponsored by the American Friends of the Middle East. After this exhibition he returned to Dhaka and the following September, he held another exhibition in the Dhaka Press Club (now National Press Club), and there he made more international contacts, like the eminent Urdu Poet, Faiz Ahmed Faiz, whom Baseer knew before, since his London days. The poet asked the painter to be prepared to hold an exhibition in Lahore, which did took place shortly. He was not sure where to stay after that, as he didn't have contacts, at that time, in Dhaka. Pressed by those in Lahore, Baseer took classes in the Lahore Art Council. He stayed there till 1961 having two solo exhibitions there. Within himself he was tormented and angry at that time. He was constantly trying to improve and perfect his style and medium. His paintings, however looked peaceful and perfect in the presentation of lines and colours. He was the firebrand mirror of his self - destructive society, which was ready to erupt. His pure, geometrical forms were replaced with uneven textures beneath the surface. He used symbols like dead lizards, restless unhappy birds in cages, and lonely boys. His famous “Wall Series” (1967-72) series, which he painted is the biggest art series . This consisted of over 92 paintings. Through the cracks of the surface one felt the longings of the human soul in quest of peace and harmony. What he presented was a smothered nation – under the brutal regime of the people of former Pakistan. 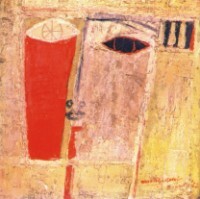 His “Epitaph for the Martyrs” (1975) was dedicated to the unknown warriors of the Liberation War. Baseer says that he took the colours of the pebbles on the canvas, from actual pebbles and inner rocks. Although depicting realism, Baseers's lines and colours are always elements that one enjoys and takes delight in. In May, 1962, at the age of 30, Baseer got married. “After my marriage, two new colours appeared on my canvas–silver and gold. This obviously spoke of bliss. Yet, soon after, there was agony in my mind, which later gave way to sad images in mind, even though life was well-organised with marriage. The forms like women figures or houses of chickens were like geometrical patterns. Later on there was Martial Law, and life was full of agony of the people around me in my society. In 1966, he painted the series paintings, “The Wall”, in which he brought in the distance between family members at home and around him. All throughout, he tried to keep his commitment to society. He did not believe in doing non-figurativ work like Mohammad Kibria and Aminul Islam, his contrmporaries. “Till the age of 41, I lived without doing any commercial job, except some mural commission which really is not a commercial job . It is creative art work. I did that in the State Bank of Pakistan, Dhaka (1968), now Bangladesh Bank. I also did murals for Habib Bank, (now Agrani Bank), and the then Commerce Bank. One has to chose between a comfortable life and the other is a hard life, that gives you all the artistic pleasures of true creation. I believe that if an artist does not want to compromise with his art his work will definite have a soul pitch, says Baseer, speaking to The Star, sitting in its premises, one sunlit morning. Asked to give his opinion of the Asian Biennale, held regularly in Dhaka, and whether it ropes in the best of visual art in Asia, Africa and Australia, Baseer says that this should be centred around Asian art. Africa and Asia of the US can participate as guest countries. Giving his opinion of the standard of visual art of Bangladesh, compared to Bangladesh's peers in the subcontinent, Baseer says that a lot of visual elsewhere – as in India – get much more support, both from government and private sectors. Nevertheless, he says, our country has not lagged behind in the quality of visual art. About our looking to the west for inspiration, rather than our own treasure trove of art, the maestro says, “In our universities and colleges, we teach the history of art. We dwell on the Renaissance, Post-Renaissance, rococo, baroque, impressionism, post-impressionism, dadaism and surrealism and modernism like pop art and op art. But the strange part is that little is taught of our neighboring countries like Thailand, Indonesia, or Malaysia Japan or China. Sure, there is a paper called 'Oriental Art',” Baseer says. “This teaches the Persian, Indian Moghul miniature, and Japanese art. But this is not in depth. I feel we should know about the art of neighboring country first and foremost,” says the professor. Touching on the subject of his contemporaries, Baseer says that Mohammed Kibria was his contemporary, but a year senior to him. Along with him were others like Aminul Islam, Rashid Chowdhury, Abdur Razzaque and Qayyum Chowdhury, A Baset and Devdas Chokroborty came after them, in 1956, he recalls. Touching the subject of learning figure drawing, landscape etc: one asks if elements like the video and computer making the business of learning art more mechanical and gimmicky? To this Baseer says that art today is becoming more mechanical, and less a matter from the heart and soul.